My nephew (of my heart) Gian passed away this week in a tragic drowning accident. He was seventeen. 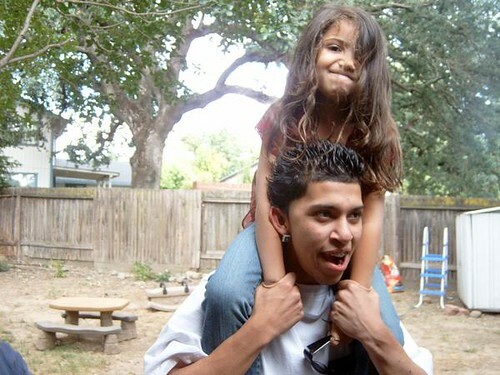 This is a recent photo of Gian and my god daughter, Trinidy. The last blog post he left on his myspace page commented on a blog post I made a while back applauding his use of a ringtone widget. Off and on through my work day, I’ve gone back to the entry. I am concerned that his MySpace page might be deleted or expire, so I am compiling some of the comments left for him in this post. I have also created a screen cap of his last blog entry and have saved it here. …I am going to share the first memory I have of Gian. He had to be six or seven years old. At the time, his brother Tony and Tony’s wife (my best friend) Rose went to the same high school with me. After school one day a bunch of kids tried to jump us (those were the days). We were very much outnumbered. I had darted into the street and flagged down the police but they were no help (big surprise). At a certain point, Tony’s mom and stepdad came to get us. They were with Gian. I remember how tense everyone was in the car over the situation. I am sure the parents were upset for various reasons, and we were all silent – except Gian. He was a kid being a kid. He kept chanting “Go Speed Racer, Go!!! !” over and over because the car was going so fast. He was naturally oblivious to the danger or difficulty of what was going on, filled with joy over the simple pleasure of a car going fast. I remember, even then, thinking he had a lot of spirit and was pretty fearless for such a little guy.